RMLNLU International Legal Essay Writing Competition (RILEC-2015), the flagship essay writing competition of Dr. Ram Manohar Lohiya National Law University has been announced. The past two editions of this competition were a tremendous success. 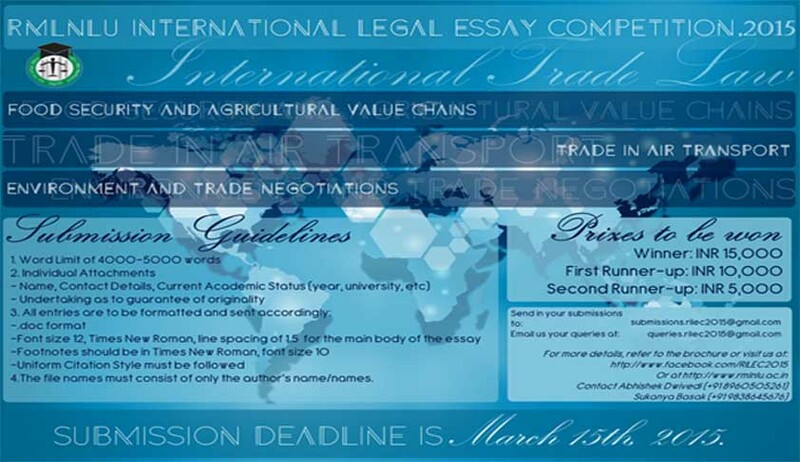 The theme for this year’s edition of RILEC is International Trade Law. Food security and agricultural value chains. Word Limit: 4000-4500 words (excluding footnotes). Formatting specifications: a. Font type and size for essay: Times New Roman | 12 b. Size for footnotes: 10 c. Line spacing for essay: 1.5 d. Uniform citation should be followed throughout the essay. The file names must consist only of the authors’ names. Students pursuing a 3 year LL.B. course or 5 year integrated LL.B. course, in India and equivalent Undergraduate law degree, abroad. Students pursuing LL.M. or Ph.D.; and/or Professionals are barred from participation in the Competition. Any attempt, direct or indirect, to contact the panel of judges will be met with immediate disqualification of the relevant entry. The last date for submission of soft copies is March 15th 2015. NOTE: No registration is required.